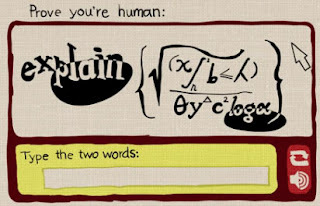 So what is captcha? Captcha is a way for automated computer software to verify that you are not automated computer software. Basically, it is supposed to make it so that any human can verify that they do, in fact, have a pulse and a brain and aren't a virus trying to post spam. Because, do we really need to learn more about Canadian Pharmacies? To make it even worse is they even offer a verbal method which can be listened to and then entered to verify your human identity. But, it sounds like a computer with a mouth full of marbles trying to read a foreign language. I will say this, their heart is in the right place. But there has got to be better ways of verifying people's identities. My suggestions: something reputation based where once you've done it a few times you either get easier images or a free pass unless your account starts acting fishy. Better yet, have something self-policing where the site admin or users can flag posts and inappropriate in which the account is closed and the comment is removed. Also, smart software can often tell the difference between something legitimate and something automated, primarily because something automated occurs with quick succession, must faster than what a typical human -- or even a superhuman -- can do in a couple of seconds. Coincidentally, last night I was watching an episode of The Middle from last season where Sue and Frankie Heck were trying to purchase Justin Bieber tickets. They got in through the system but got hung up on the captcha until they ended up timing out, unable to purchase the tickets. Why is it funny? Because it is true. Captcha might turn away the spambots momentarily, thought they will find a way to circumvent it eventually, and it only hurts legitimate people trying to leave a comment on a blog or sign up for a newsletter. I struggle with captcha at times, but can usually get it within three attempts. I don't think that is bad. But what of the dyslexic? The elderly? I just hate the thought of legitimate traffic being turned away because of captcha. It is why turning it off was one of the first things I did when I started this blog (your welcome). Anyway, sorry, didn't mean to vent or get this high on the soapbox. But, seriously, there has got to be a better way. The technology is starting to become obsolete and it is time for a newer way of handling these problems. Yay! Glad you're part of this. Also, why was I not following your blog before? Silly me! There is truth spoken in every sentence of this post. Let all who come hereafter know this. did i scare them away?